Cadillac's most powerful road car ever | What Car? The most powerful road-going Cadillac ever built will cost from 56,495. 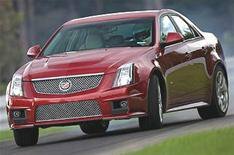 The Cadillac CTS-V saloon is powered by a 556bhp supercharged 6.2-litre V8 with 550lb ft of pulling power. It goes from 0-60mph in 3.9sec. It's available in one trim level (V-Series), and buyers can opt for an automatic gearbox for an extra 2500. The CTS-V will only be available in left-hand drive, though - Cadillac says it would be too costly to re-engineer it as a right-hand drive.